During the visit, a cooperation agreement was signed to create a Scholas Department at Universidad Austral’s School of Education. This department will be opened to all of the university’s units to help train leaders for a peaceful, closer mankind via seminars, teachers’ enhancement activities and collaboration in projects that enable Universidad Austral to actively address the needs in its environment. 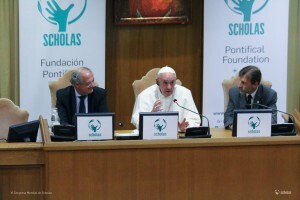 As Dr. García Pintos pointed out, the meeting made it possible for universities around the world to share Pope Francis’ teaching ideas, the source of inspiration for Scholas’ philosophy, in order to move forward on an education-driven change that will help build a more humane world. “At the closing event, Pope Francis did not hesitate to characterize the world as ‘cruel’ and to call on everyone to use education to contribute to restoring it from its current distressed state,” he remarked. Against this backdrop, university teachers and universities are encompassed by this call to action. Their responsibility hinges on guiding, organizing and encouraging future professionals to embrace their social commitment, in addition to providing them with excellent training. Today’s complex and profound scientific development increasingly requires a clear, resolute conscience that focuses on values supporting human welfare. Without a clear conscience, science can lead to mayhem and social impairment. The goal is to develop a conscientious science. Based on this notion, universities are summoned to commit to investing resources to promote a new development approach based on togetherness and solidarity, zeroing in on respect for individuals and focusing on their unique traits. The true change should start with a positive reorganization of the values that serve as cornerstones for our culture, which have been neglected or overlooked in recent times. We should reflect on these values, delving deeper into them to reformulate them according to current changes. Relying on education to create a new intellectual environment, a fresh approach to thinking, reading and changing reality. The final goal is to build a consistency among what we think, how we feel, and what we do. Time and again, Pope Francis refers to educating minds, hearts and hands –that is, teaching people to think, to feel, to engage in the world, and to commit to the common good. “The intended result is a neohumanism that reinstates us as brothers,” concluded García Pintos. If you are interested in joining the Scholas Department’s projects, bringing your own initiatives or those of other academic units, please write to Julio Durand at jdurand@austral.edu.ar.